Now that normal service has resumed, it's time to go back to dwelling on those all-important issues dragging us down before. Namely, 3DTV and the nail in its coffin—3D glasses. 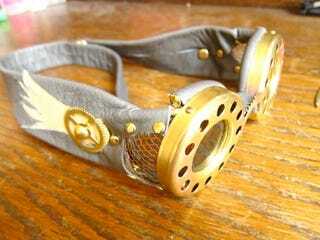 Step back in time with steampunk 3D goggles. Cinemas would be doing a lot better out of 3DTV if the glasses they were offering were actually fun, like these Kraken steampunk goggles that have turned up on Etsy. For example, I'm actually going to see Alice In Wonderland in 3D tonight for the second time (I'm not a fan of 3D, but my friends are dragging me there, kicking and screaming along the way), but if I knew there was a chance I could walk out of the cinema with a stolen pair of Kraken goggles, I'd at least turn up on the IMAX's doorstep with a smile on my face.